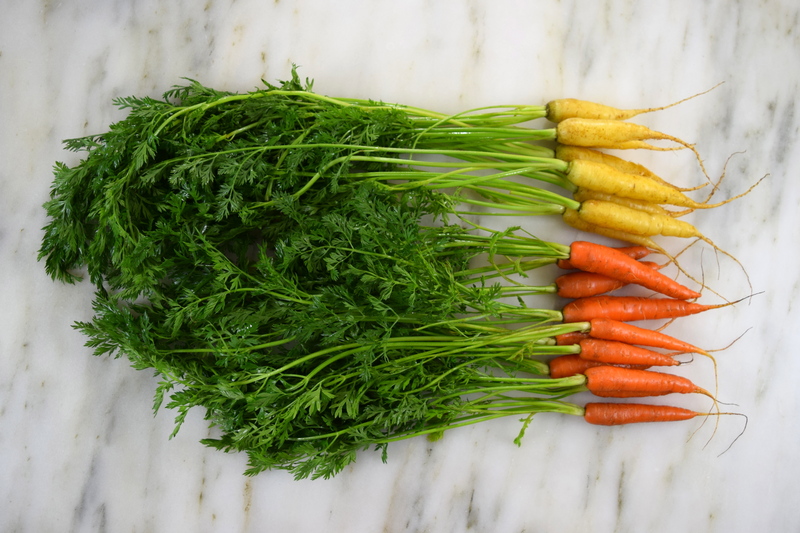 I have always been intrigued by colored carrots, even since I saw them at the Portland Farmers’ Market a couple of years ago. Recently, when I was searching for ideas on the Food and Wine website, I saw this recipe and “pinned” it for later. 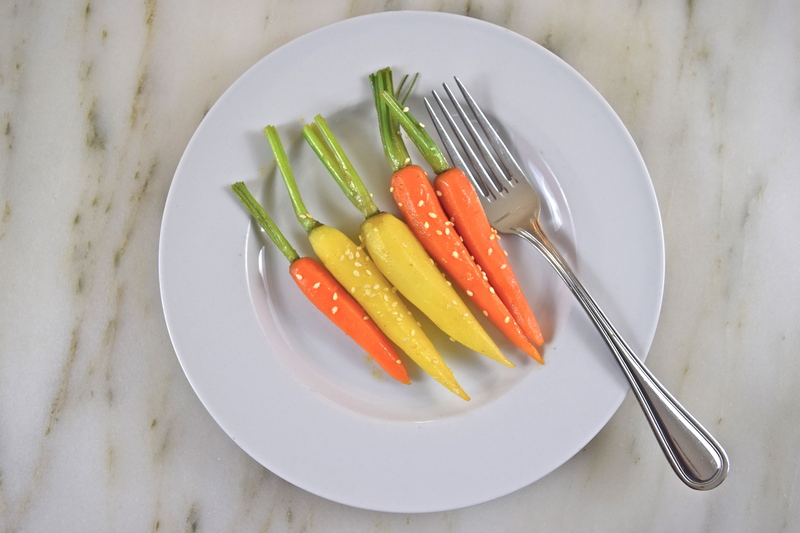 When I was at Whole Foods today, my eyes spotted the carrots and I had to make this! This beautifully simple and tasty dish was created by Richard Blais, winner of Top Chef, a couple of TV seasons ago. As usual, I made a few modifications. 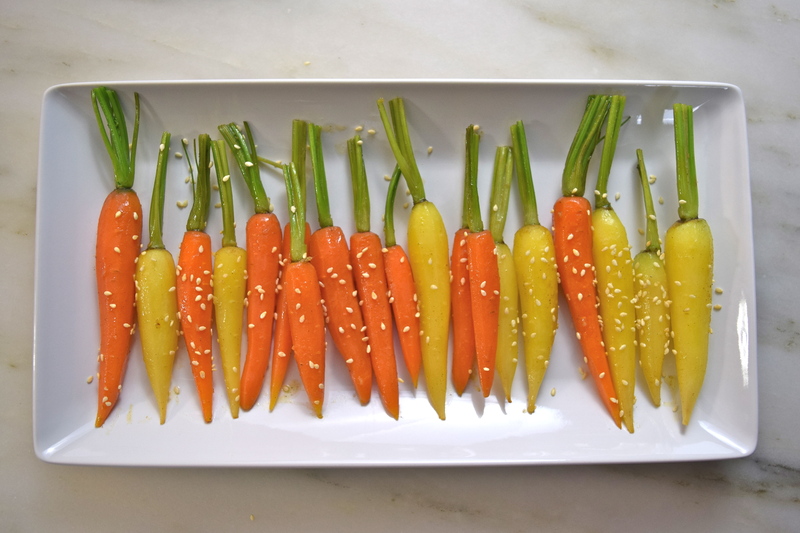 Cook carrots in a large saucepan of boiling salted water for about 2 minutes, until slightly crispy. Drain the carrots. In a large nonstick frying pan, heat oil over moderate heat. Add the ginger and cinnamon, then the carrots, stirring occasionally for about 3 minutes. Add chicken stock, cook until the stock is reduced by half. Remove pan from heat and let cool for about 30 seconds. Stir in butter, lime juice and Tabasco Sauce. Add salt to taste. Sprinkle with sesame seeds. Serve on a platter. 4 servings. I am really enjoying reading through your blog. I like your photography style very much, very minimalist and focusing on the food, as well as your no-nonsense writing. Glad you joined the blog world!